Premium candle boxes are used to display, pack, and ship homemade candles. Adding the extra touch of a sturdy and attractive candle box can make a huge difference in both sales and safe transportation of your products. There are lots of different ways to package your candles, including shrink wrap and decorative bags. Each method has its own advantages, and you'll want to make your choice depending on the type of candles you make. Pillar candles, for example, can be sold without much packaging. A tight cover of plastic wrap with a decorative ribbon tied around the candle is a nice presentation. On the other hand, a dozen tea lights would be awkward for your customers to carry without a sturdy package to hold them together. While you can sometimes get away with using boxes that you might already have on hand, ordering premium candle boxes that are specially made to fit the size and shape of your candles is always a better idea. Shipping candles can be expensive since they are generally heavy items. A candle box that isn't too large will save on postage, and prevent waste from the addition of extra packing materials to keep the candle from bouncing around inside. Candle boxes come in a variety of shapes and sizes, and are made of a few different materials. Clear plastic candle boxes are ideal for displays, as customers can see the candles but they are still protected. Votive and tea lights are most commonly found in these containers. Sturdy cardboard boxes with cut-out windows are perfect for sets of taper candles. Smaller boxes made from cardboard can hold single votives as well. Container candles using glass or ceramic containers can be safely packaged in these boxes too. If you're putting together premium candle gift sets, consider ordering custom-made wooden boxes to make the presentation extra special. Candle boxes can be handy in many other situations as well, whether you make candles or just enjoy using them. Pick up some pretty candle boxes to place engraved votives in as wedding favors. These can be decorated with flowers, ribbons, or other accents. Thinking of giving candles as gifts? 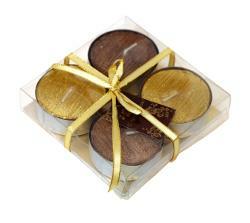 Plain candle boxes can be decorated, and they are much easier to gift wrap than the candles themselves. A special candle box can be used to store a memory candle, Christmas candles, or others that have sentimental meaning. Candle boxes can be purchased at most candle supply stores. You can also look into having boxes custom made for your candles, and include things like your business logo and contact information. BetterBee - BetterBee offers both clear and cardboard boxes with windows, which come with candle safety instructions printed on them. Box and Wrap - Here you can choose plain or printed boxes for votive candles, and you have the option to get your logo embossed on them. The Box Co-Op - There are lots of styles to choose from here, including tart, pillar, diffuser, and jar candle boxes. You can also add custom windows to these boxes. Premier Packaging - This company specializes in four sizes of gloss candle boxes. You must purchase them in lots of 100, but the prices are quite reasonable. If you sell your own homemade candles, packaging can play an important role in your sales. People like to see a pretty package, and candle boxes offer both an attractive look and protection for your hand made candles.